A young girl has lived in isolation for so long that she’s forgotten her name. 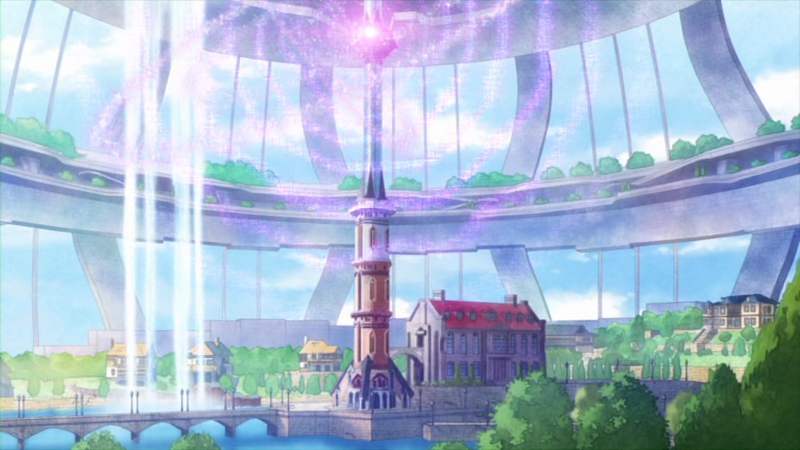 But when she’s ‘spirited away’ into space, she finds herself on board Norn, an Eden-like spaceship/flying geodome, which is home to a specially selected group of young people, each gifted (or cursed) as she is with a unique special ability. Their goal? To protect the peace on Earth under the guidance of a mysterious organization called The World. Taken onto the team of the charismatic Kakeru, she suddenly remembers that she was given the name Koharu by a mysterious traveller. Now there are three young women on the ship as Koharu meets lively Mikoto and troubled Nanami Shiranui. 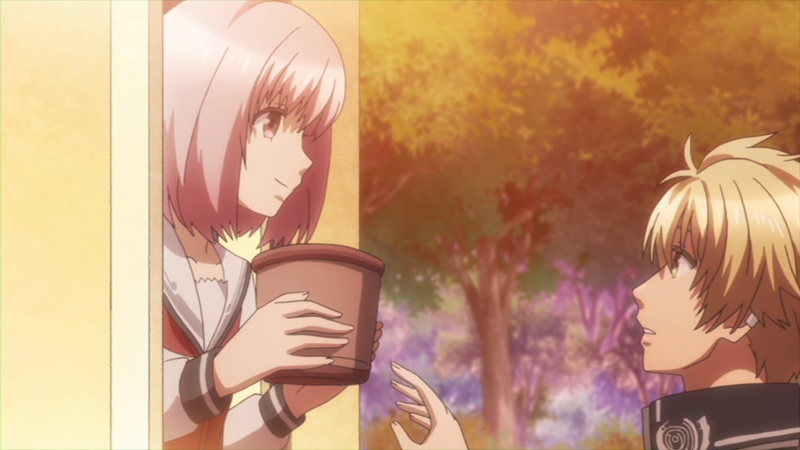 Koharu and Kakeru soon bond over their shared love of gardening. But all is not well in their little Eden as Norn is attacked from outside, leading to suspicions that there is a traitor in their midst. Koharu uses her ability to try to protect the ship – and it’s a destructive weapon-like fire skill. And the arrival of another new member, a young boy called Sorata from 2016, raises even more questions. Who is the mysterious translucent girl Sorata hears singing on board the ship? Could it be that the mission is not as beneficent as the young people have been taught to believe? Are their special abilities about to be used for a darker, more destructive purpose? What is the true identity of the traveller who gave Koharu her name and told her to wait for a ship to come for her in the spring of her seventeenth year? And what is the Reset? 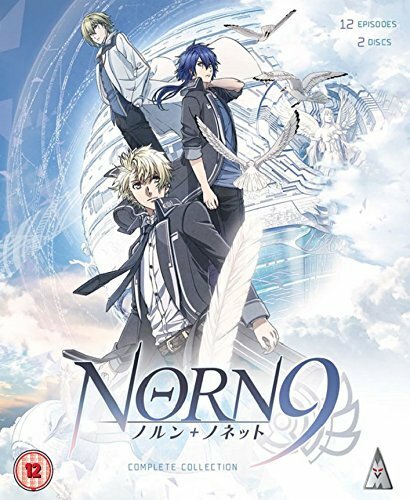 Norn9 is another reverse harem series taken from Norn9: Norn + Nonette a PSP otome game by Otomate (Sengoku Night Blood ). Are the three young women on the ship meant to represent the three Norns of Norse mythology, spinning the fate of the world? They have three suitors each, adding up to nine potential male partners, so… Unfortunately, this series encounters all the usual problems involved in adapting an existing game, including deciding who should be the main protagonist. It’s the boy Sorata who is the MP in the original game but here Koharu takes centre-stage. The result? The back stories of the other ability users are sidelined in the interests of telling her story – but in order to keep those who have played the game on board, they are hinted at, leading to unnecessary frustration for those who have not. Is this an unavoidable consequence of adapting a game to anime, I wonder (and not for the first time)? 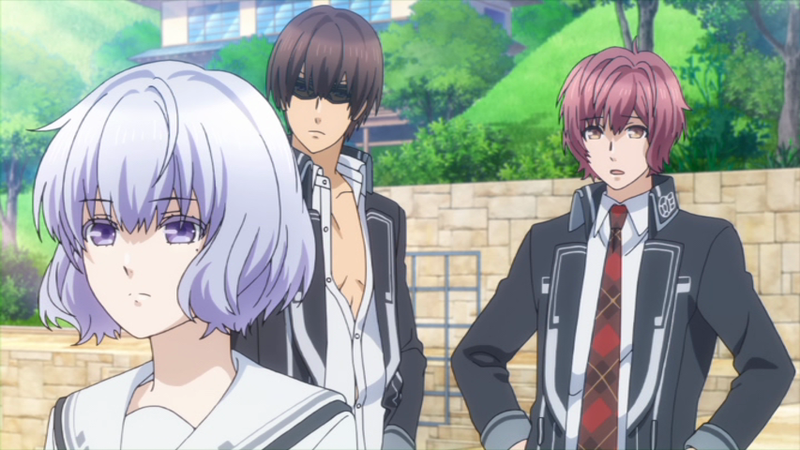 There’s no doubt that this series makes more sense on a second viewing if – like me – you haven’t played Norn9. So it’s probably worth spooling back, as I did, before tackling the final episodes to get a better understanding of what’s going on. In fact, it’s not made clear until much later on in the series exactly what’s at stake. (And then when it is made clear…it masquerades as a big Science Fictional Idea but really isn’t so much, eliciting an ‘Oh, good grief!’ reaction from this viewer.) There’s much suspicion generated among the young people spirited away. They refuse to reveal the nature of their special abilities to each other – although some have shared pasts – and there is almost certainly a traitor in their midst, sabotaging the ‘ship’. 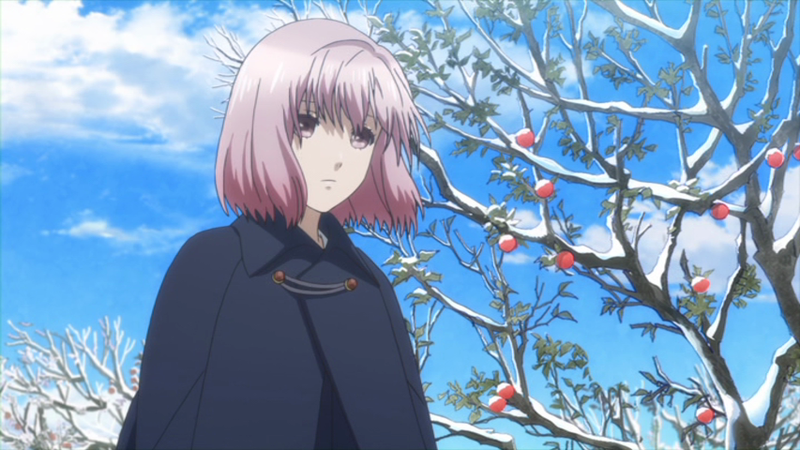 Pink-haired heroine Koharu is presented to us as not so much a blank as impossibly naive and over-sheltered (nurtured away from people). It’s a given that the heroine of an otome game/reverse harem must be bland enough for the player/viewer to imagine themselves in her place. But even later on when she begins to speak up for herself, actress Ayumi Fujimura’s voice is often pitched so high that it would be far more appropriate for one of the tiny mascot animals that so often feature in anime (i.e. a cute squirrel) – and this doesn’t work in her character’s favour. (On Norn we have cute little chickies/duckies who also act as cooks and helpmates. Yup. I know.) Fortunately Yuuki Kaji (Eren in Attack on Titan) turns in a sympathetic performance as Kakeru and the other cast members are also easier on the ears. The show looks very pretty with a misty blue, silver and green palette for the idealistic interior of Norn contrasting with the earthy, darker colours used to portray the Real World far below. The character designs (by Yukari Takeuchi, based on the originals by Teita) are also – of course – very pretty for all three main girls and their trios of attendant beaux. But no amount of prettiness makes up for the muddled and poorly delivered plot or for the fact that the blank main protagonist is difficult to identify with or sympathize with. Even a fantasy episode in which each girl ‘dreams’ herself as a character from fairy stories: Red Riding Hood, Cinderella and Snow White in order to determine which of the boys is her ‘true’ partner masquerades as psychologically revealing but is little more of a distraction and an excuse for cosplay. By far the most interesting feature of this series is that the music is by up-and-coming Australian composer Kevin Penkin, currently in the news for having delivered the impressive score for Made In Abyss. His imaginative score ranges from powerful choral and orchestral climaxes to intimate piano moments and does much to lift this series way above the average. 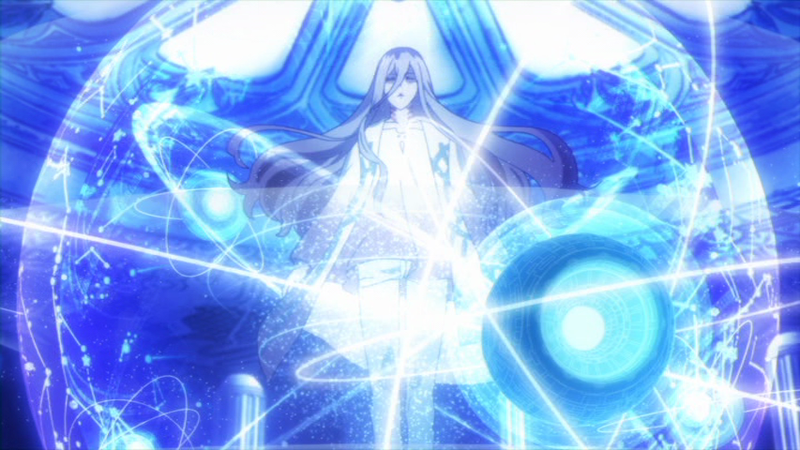 I suspect that Aion’s beautiful insert song is also his work; so many science fictional series rely on having a pure-toned female vocalist singing a song that – somehow – instigates or changes everything that happens in the plot. But here, it’s such an attractive composition that I can almost forgive the script writers falling back on such a convenient anime cliché. The likable Opening is “Kazekiri” sung by Nagi Yanagi, the VA for Aion in the show and the Ending is “Zero to Kei” performed by Kaori Oda. The only extras are the textless Opening and Ending songs. 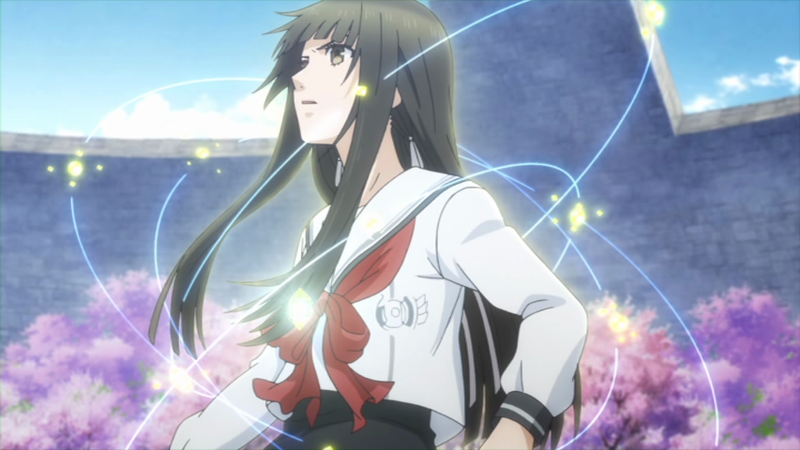 If you don’t mind a rather unoriginal science fictional plot, Norn9 is still worth watching, if only to discover how the addition of an excellent and inspiring soundtrack can lift a series and enhance the viewing experience.